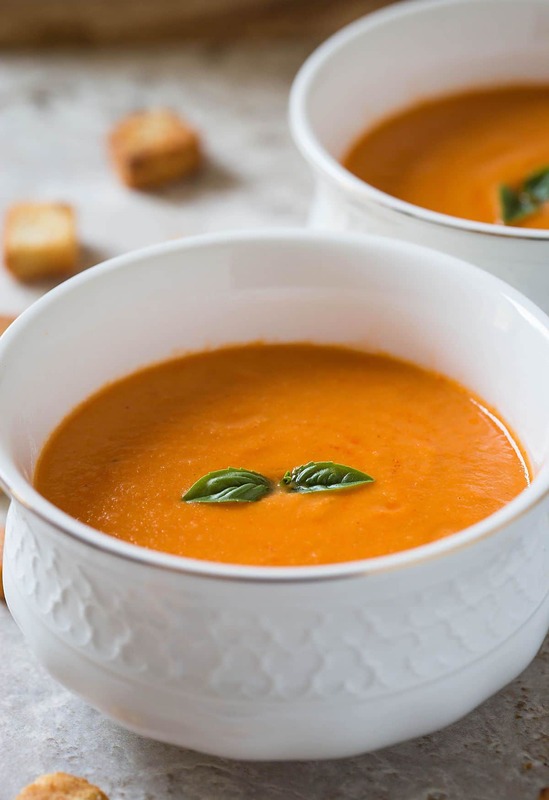 This Creamy Roasted Tomato Soup is prepared using fresh tomatoes. 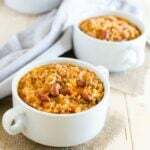 It is a healthy, creamy and comforting soup perfect for light lunch/dinner with some bread toasts, appetizers or sides. The best part of this creamy luxurious soup is that it is free from cream, butter or added sugar. Which means you can eat your soup guilt free without thinking much about bad calories. Moreover, it is prepared using fresh red tomatoes which make it taste so good with natural flavors that you’d definitely want more than a bowl! I know it is still summer and thinking about soup gives me a feeling of fall and winter knocking my door. 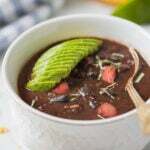 But some soups are meant to be made in summer to enjoy flavors from fresh produce. For example, fresh corn chowder and of course this healthy roasted tomato soup that I am talking about. Don’t you think? This is the easiest soup I have ever made. It involves little to none preparation time. 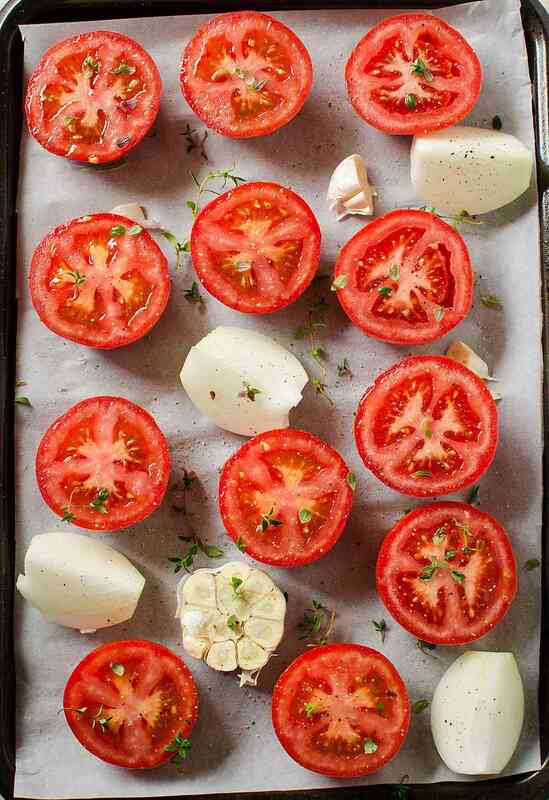 Cut fresh red tomatoes into halves and place them on a baking sheet. Also, throw in an onion and a garlic bulb along with the tomatoes. Sprinkle some fresh thyme leaves, salt, and pepper. Bake tomatoes in a preheated oven to perfection. Transfer roasted tomatoes, onion, and garlic to a blender jar. Add some raw cashews, cayenne pepper, milk and vegetable broth and blend to a smooth consistency. Your tomato soup is almost ready. Transfer this blended soup to a medium pan and bring it to a boil. Adjust seasoning according to your taste, if necessary. Detailed instructions are given below. For delicious and tempting homemade tomato soup choose rich colored and firm fresh tomatoes. I use tomato on the vine variety for making this soup. To give this soup a more creamy texture you can also add one small cooked potato while blending the soup. However, this involves an additional step of cooking potatoes and therefore, most of the time I don’t add because I’m very lazy. Another key to this creamy soup is the blending process. Make sure your blender will do this job perfectly. My Blendtec Blender has soup mode on it and it does its job exceeding expectations. 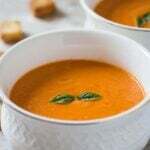 Do not use Aluminium pots (especially non-coated) to make this soup as tomatoes are naturally acidic in nature and can react with the metal while cooking. Tomatoes are rich in lycopene which is an excellent antioxidant that gives a rich color to it. The darker the tomatoes the more lycopene it has (1). Also, it is a low-calorie vegetable with fewer carbohydrates. To give this soup a creamy texture, cashew nuts and low-fat milk are the key ingredients I used. Cashews nuts are a good source of monounsaturated and polyunsaturated fats. 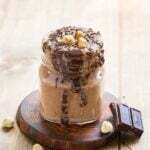 Also, it is naturally rich in dietary minerals and a source of good protein (3). This easy roasted tomato soup involves very less prep time. Doesn't require additional skills to make this delicious soup and no need to babysit this one when making. 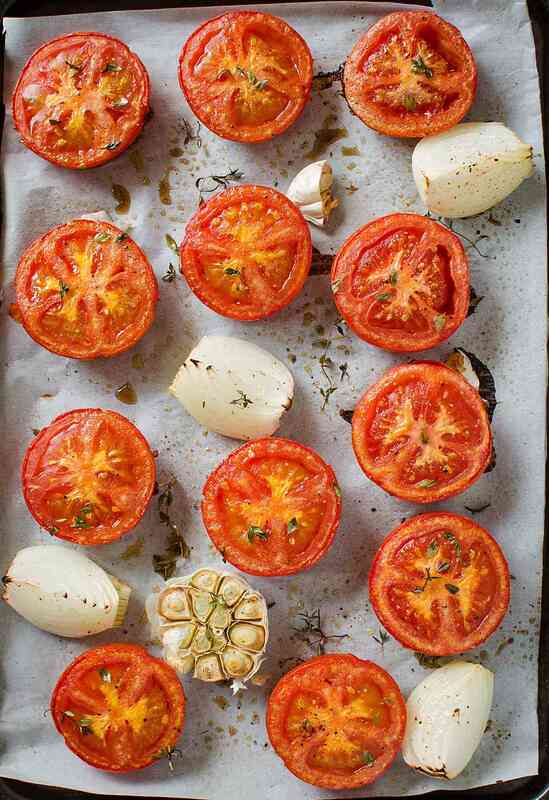 Cut tomatoes into halves and onion into quarters and place them on a baking sheet facing cut side up. Then cut the garlic bulb 1/2" from the top to expose individual cloves. Add it to the baking sheet. Sprinkle thyme leaves, salt, and pepper. Then drizzle or spray some olive oil. Bake everything in the preheated oven for about 30-40 min or until the edges of onion, garlic and tomatoes start to caramelize. 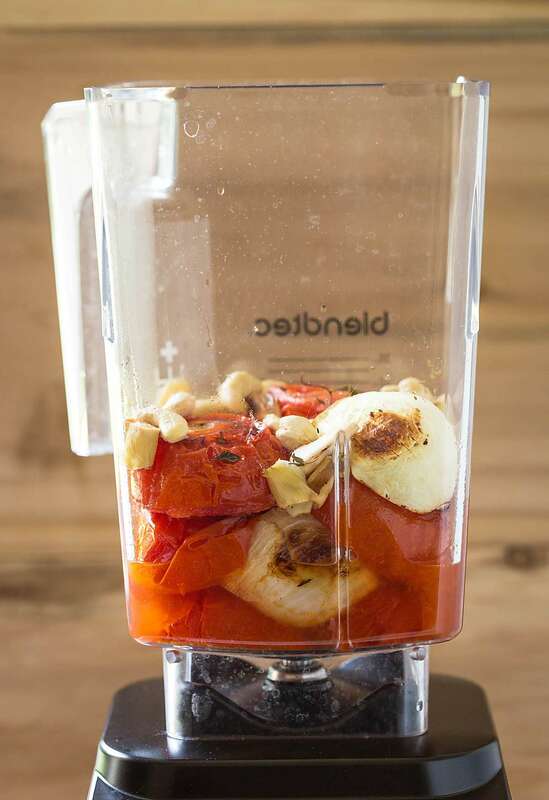 Add roasted tomatoes, onion and a few roasted garlic cloves to the blender jar. Then add some cashew nuts, milk, cayenne pepper, vegetable broth and blend to a smooth consistency. Transfer the soup to a medium pot and bring it to boil. Adjust seasonings and cook till it gets to the desired consistency or serve immediately with some bread croutons. Do not add all the garlic from the bulb after roasting. Add according to your taste and store leftovers in the refrigerator for future use. 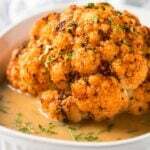 If you love creamy soups then you may also want to try these creamy broccoli soup and creamy cauliflower soup. This looks healthy and delicious!! Bookmarking this for when we finally have cooler temps! I can’t wait to try this! Yummy! With cool weather around the corner, this soup look so yummy and comforting! 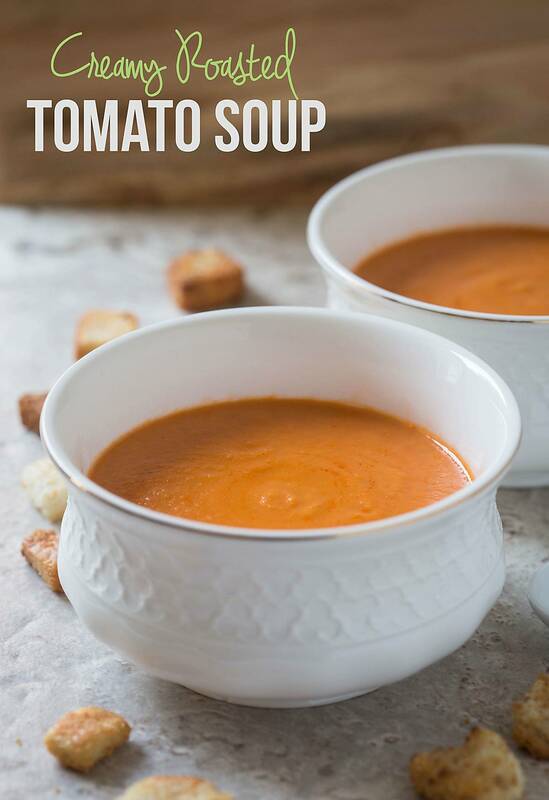 Tomato soup is a favorite around here! This looks so incredible and perfect with grilled cheese! All the heart eyes for this! 😍😍😍 Looks so yummy and less than 200 calories?!?! It’s so funny that I’m not a fan of tomatoes but I love tomato soup! The last recipe I tried wasn’t exactly the best, but this looks amazing! Tomato soup is one of my all time favorite soups and pair it with a piece of cheesy bread and I am in heaven. I love how you used the cashews to make your soup creamy. I’m chilly right now, and this soup sounds sooo cozy and warm. Perfect for a cool fall day!